Buying an older computer might seem stupid, but you can save a lot of money, and have that warm fuzzy feeling inside of helping the planet. An "old" (2009?) computer in 2019 might seem a rubbish idea, but there are two simple upgrades that are a cheap and easy to give that old computer a new lease on life. For most of us the older computers are still powerful enough, especially with upgraded parts inside. If you really and truly need high end graphics -- like you&apos;re editing video all the time -- skip this posting, because it&apos;s not for you. But most of us are just browsing the web and writing documents, and will be perfectly served by an old computer at a fraction of the cost. 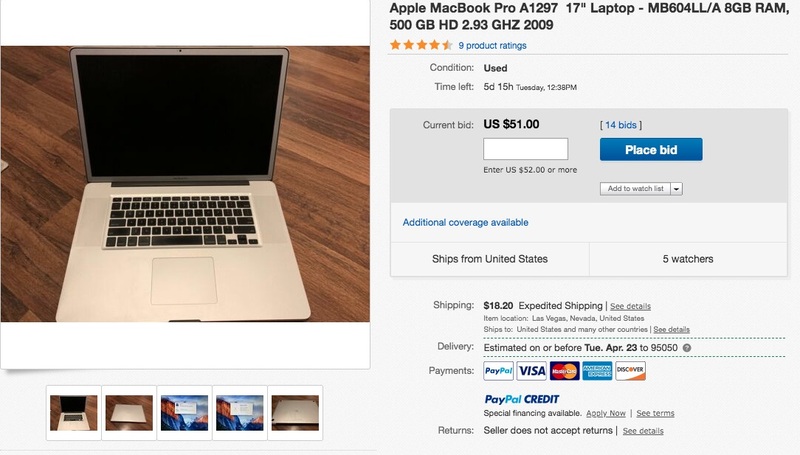 For this posting I&apos;ll look at a couple eBay postings for the cheapest MacBook Pro&apos;s and evaluate what kind of upgrade can be done. Select an older computer, being careful to choose an upgradeable computer, that has capability to fit your needs. Learn how to upgrade the computer. Buy the computer, being careful to not get scammed. Test the computer after receiving it, to be sure to not get scammed. We&apos;ll be going to places like Craigslist, eBay, or thrift stores like Goodwill. 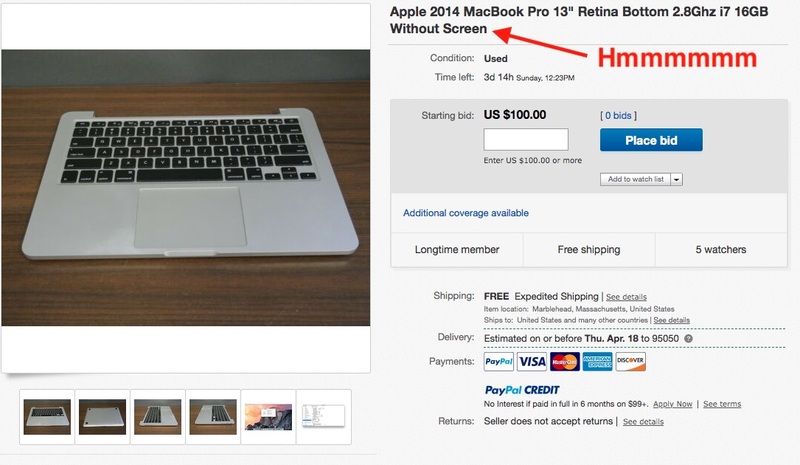 In all three it is possible to get scammed, but there are ways to evaluate the item and avoid scammers. 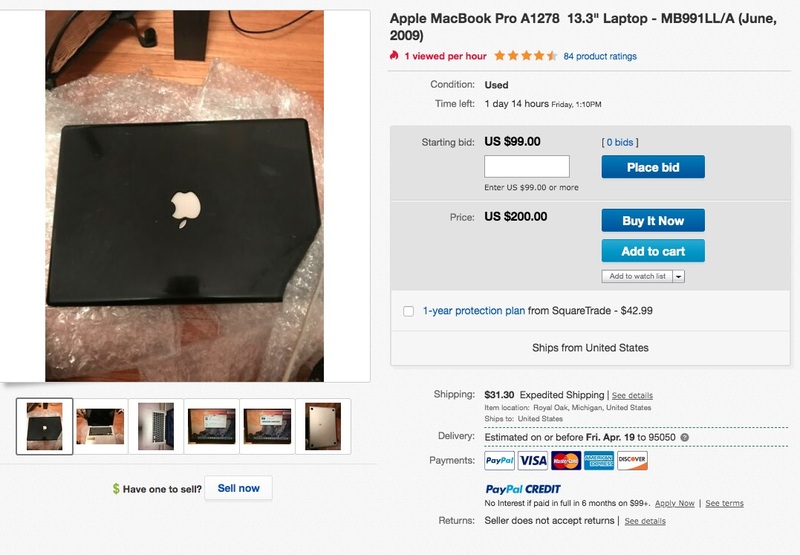 For the purpose of this post let&apos;s assume you&apos;ve decided a $100 MacBook Pro is your budget. In other words, we have pre-selected to buy a MacBook Pro, and to limit ourselves to whatever can be purchased for $100. I selected this parameter because I personally know the MacBook Pro market fairly well. If your preference is something else, this should still be of value and you&apos;ll just have to extrapolate a bit. For the old Mac market the site - EveryMac - has a wealth of information. Of importance is to note the maximum specs for each model you&apos;re considering, the maximum memory, the kind of disk drive, and so forth. Another very useful site is iFixit for repair/upgrade guides. You&apos;ll need to read up on the upgrade process before choosing a computer to be certain the upgrade you want is possible, or whether you want to attempt it. A couple years ago I bought about six MacBook Pro&apos;s from 2009-2011 vintage. I had a crazy plan to buy these off eBay, perform upgrades, then resell them as upgraded machines, and I should make a profit. 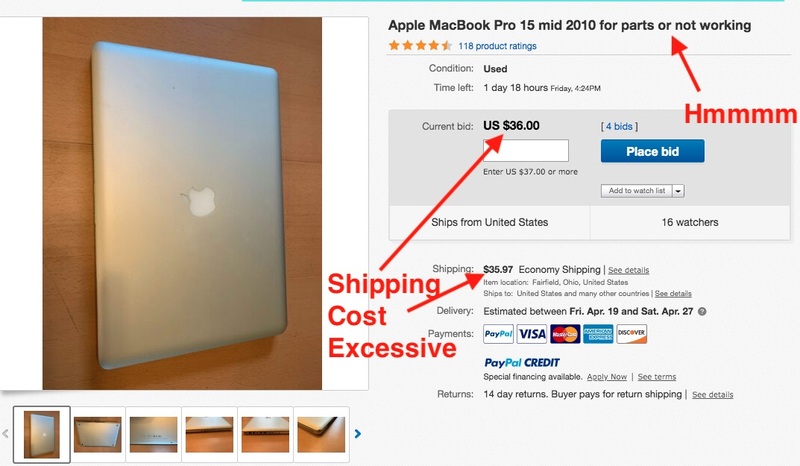 It didn&apos;t generate much profit, but along the way I learned a fair amount about evaluating eBay listings. 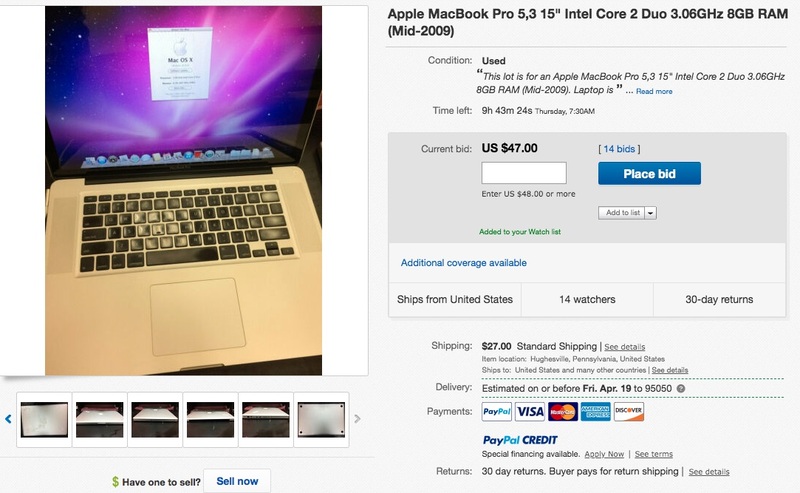 First step - go to eBay, and type in the query like MacBook Pro. Or if you&apos;ve selected a model year, MacBook Pro 2009, or if you want one with more memory add the memory size like MacBook Pro 2009 8GB. The more specific your search phrase, the fewer uninteresting listings you&apos;ll have to evaluate. On eBay you can add search parameters in the sidebar. It&apos;s pretty slick. To get the cheaper models, sort the results by price from low to high. I&apos;m scrolling past a bunch of new listings with no bids yet in order to find the item I&apos;m looking for. This came up as an item to obviously avoid, and it is worth explaining what this is so you don&apos;t have to waste time evaluating it. In MacBook terminology the topcase is the upper half of the assembly containing the keyboard, the logic board, the battery, the optical and hard drives. Specifically the topcase is ONLY the metal chassis plus the keyboard. It probably does not include a logic board or other parts. This is useful only if you&apos;re willing to transfer perts from an existing MacBook Pro, e.g. your old computer may have had liquid damage and you want to replace the keyboard. It is not a complete working computer, so skip over it unless you have the technical chops to use it. But if you are that person you&apos;re probably not reading this post. Here&apos;s our first possibility. It&apos;s not a MacBook Pro, but a MacBook, but it&apos;s worth a few minutes. According to EveryMac the model is rated by Apple to support 4GB memory max, but the people have found it&apos;s possible to run it with 6GB memory. It uses older DDR2 memory which may be difficult to find today. It uses a normal SATA drive, so at least the disk upgrade will be straightforward. The pictures in the listing look clean. However a detail that stands out is pictures of the screen. In one it shows a desktop background with a galaxy, and two others shows a desktop background from the Sierra Mountains. The galaxy picture corresponds to Mac OS X Lion, which the listing says this computer has installed. But the backdrop with the mountain range matches either the Mac OS X High Sierra or El Capitan release. 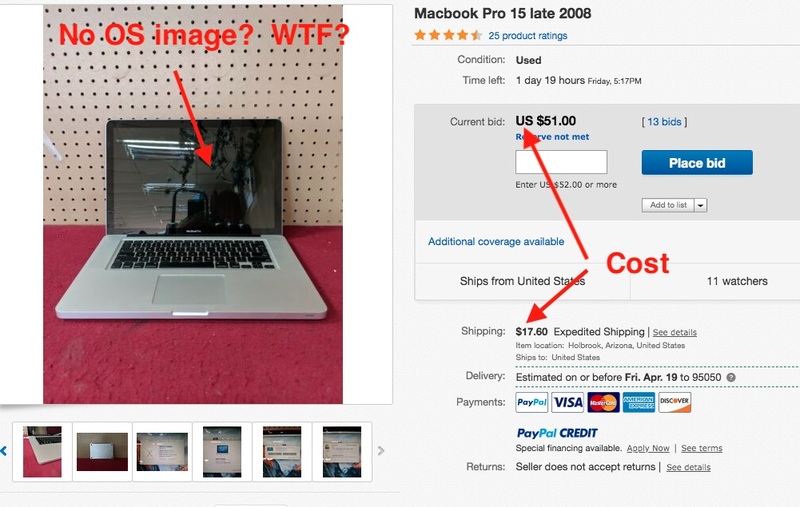 This detail raises a question of whether this is a legitimate listing, since the pictures do not match what&apos;s claimed. The seller claims to have refurbished the computer, but did not do an upgrade. It has an SSD drive meaning the disk had been upgraded, but with the cheapest possible upgrade, and the memory was not upgraded. This is a MacBook Pro 2008, 15". I know from experience that the cost restraint, $100, is going to hugely limit our choice. If we allowed ourselves a $200 budget we could think about a 2009 MacBook Pro and have a more powerful machine. This listing looks pretty good, however. It&apos;s the late 2008 model, with a 2.66 GHz Core2Duo and 6GB of memory. According to EveryMac this is the maximum amount of memory, and like the MacBook it is 667 MHz DDR2 memory. Nowhere does the seller explicitly say a power supply is included. So, ask about this before bidding. This is probably going to sell for over $100, outside our budget, but we can dream. It is a 17" laptop meaning - are you going to carry this around, or will it be on your desk all the time? With 8GB memory, the memory has already been upgraded to the max. The memory runs at 1067 MHz, which is quite a bit faster than the 2008 laptops, meaning this machine will perform much better. The disk can still be upgraded to an SSD. The seller says there are a few scuffs on the bottom - and includes pictures for proof. The seller says a charger is included, but does not show its picture. Because this is listed as "for parts or not working" it will go for less. It is a 2010 model with a Core i7 CPU and with 8GB of RAM. If this computer could be repaired it would be a screaming deal. A lot depends on what&apos;s actually wrong - why is it listed this way? The disk and battery has been removed, for some unstated reason. Among the pictures is one with the computer turned on showing the &apos;?&apos; inside a folder icon, which is probably simply because the disk is missing. Nothing is said in the listing about whether it functions beyond this. It&apos;s worth sending the seller a question to learn more. And, to do a gut check, are you willing to try to repair this computer or what? Maybe all that&apos;s needed is to install a disk and a battery (and maybe a power adapter) and it could be worth well over $200. Or maybe there was liquid damage that made the computer flaky. This lot is for an Apple MacBook Pro 5,3 15" Intel Core 2 Duo 3.06GHz 4GB RAM (Mid-2009). Laptop is firmware unlocked. Has significant scratches/scuffs on the top and bottom. Does not include charger, or hard drive. Please check keyboard to ensure it is the type you require. Password is password. See all photos. WTF? Other areas in the listing say 8GB memory, and the included pictures show it booted up and running. How can they say it&apos;s only 4GB of memory, does not include a disk or power supply. And it implies there is a firmware password. Many red flags that maybe contacting the seller could clear up. This deal is definitely not for the faint of heart, but would be a screaming deal for someone competent with computer repair. What is offered is the lower part of the computer, no screen, no hard disk, no power adapter, and no case screws. It&apos;s possible this computer is the victim of the Flexgate Problem in which certain MacBook Pro Retina models had display cables which were too short, and the cable broke. The game plan here would be to ignore the missing display and to use this solely on the desktop, connecting it to a monitor. You&apos;d then add in a disk drive, and get new case screws, and a power adapter, and you&apos;d have a fine desktop computer. I&apos;m not going to evaluate this one since it will easily go for over $300. But look at the memory (16GB) and disk (500 GB SSD). This is our end goal, to get a computer where we can max out the memory like this, and install a sizeable SSD drive. Buying this laptop would let you skip past the task of upgrading the computer yourself. The seller has already upgraded it to the max. Let&apos;s pretend this is the machine we&apos;ll try to get. It is a 2009 MacBook Pro with 4GB of memory and a regular spinning hard disk. The interesting thing is this shiny black finish, that may be a custom case. Will the seller actually get $200 for it? The seller says it does not come with a power supply. Those are around $30 on eBay. The memory on this model can be maxed out to 8GB of 1067 MHz DDR3. That&apos;s a very cheap upgrade, and very easy. You simply unscrew the bottom part of the case, disconnect the battery, pop out the old memory sticks, and insert the new ones. The old memory sticks can be sold on eBay to recoup some of your cost. Removing the bottom part of the case is very easy. It&apos;s 9 screws, you just have to careful since they&apos;re small to not lose the screws. Replacing the hard drive is a little more involved. Physically it is trivial, since you simply open the case, then unscrew the old drive, and replace it with the new drive. The tricky part will be installing an operating system on the new drive first. Tricky does not mean hard, it just means you&apos;ll need a little bit of skill. Namely -- you have to download the desired Mac OS X installer, and then burn it to a thumb drive. Instructions for this are widely available. Once you&apos;ve burned the installer to a thumb drive, you boot from the thumb drive, and go through the installation process. This process is very easy. To give the computer the best speed - replace the drive with an SSD drive. It will give the computer a huge speed boost, enough to breath a whole new life into what is obviously someones cast-off neglected computer. The seller of this computer obviously thinks it&apos;s an old piece of junk, but you can rejuvenate it and give it a few more years of useful life. That requires -- maxing out the memory -- installing an SSD drive. The last upgrade to consider is to remove the optical drive, and install a hard drive caddy. That enables the computer to have two disk drives.